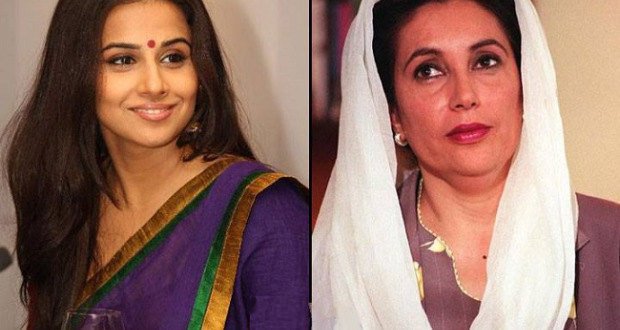 Versatile bollywood actress Vidya Ballan has now been offered to play the role of former Prime Minister of Pakistan Benazir Bhutto in a biopic. The dirty picture girl Vidya Ballan has not confirmed the news yet and still no authentic resources have verified the news. Vidya Ballan has efficiently performed many portrayed roles. In Dirty Picture her portrayed role of Silk Smitha got a huge applause from viewers and both the movie and actress won numerous awards. Now days, she is busy in her upcoming movie Hamari Aduhari Kahani which release is expected soon. Benazir Bhutto is former president and first female president in the history of Muslim Umma. She is earned huge popularity and her charismatic personality impressed millions of people all around the World. In 2007, she became a victim of suicide bomb blast after addressing an election campaign in Rawalpindi. The chances of the movie success are great because the script will create interest of both neighboring countries. However, there are huge chances of political influence on the movie because India blocked a film in 2014 that was about the assassination of former President Indira Gandhi.